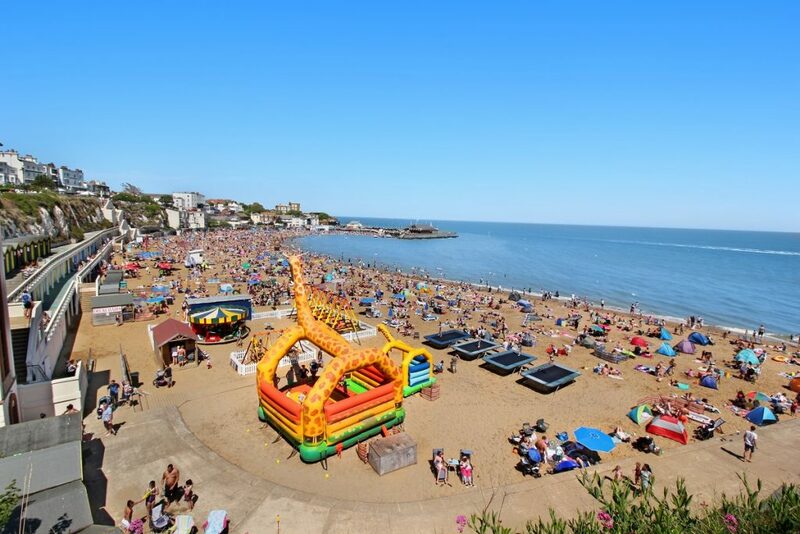 Here are our favourite things to see and do in Broadstairs. 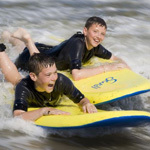 Just meters from the flat, Viking Bay with sandy beaches, and activities for the kids. Not to mention the rock pool with marine life. Time appears to have stood still for Viking Bay. The half-moon shaped sandy bay remains the same today as it has always been. It is still the premier beach and resort in the area however it does have some stiff opposition. Viking Bay is a typical Victorian beachside destination and it still has its brightly coloured beach huts, pier, and wonderful promenade sitting nonchalantly at the top of the resorts white cliffs. Looking down onto the harbour is Bleak House, which Charles Dickens used to frequent, he actually wrote his novel David Copperfield there. There are steps taking you down to the clean sandy beach or if you have mobility issues, there is a lift to take you down and bring you back up to the promenade. While at the seaside, you should really try the fish and chips. There are many good fish and chip outlets such as Aqua 43, Shakey Shakey or Star of the Sea – all of which are equally first class however, there are many great restaurants if you would like a bit of comfort. 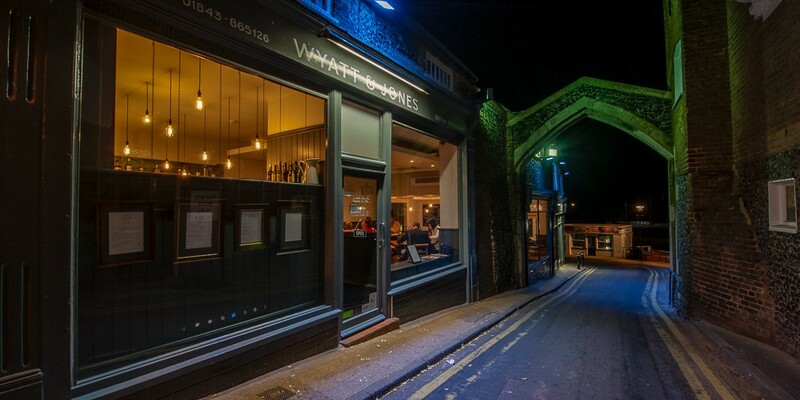 Why not try Wyatt and Jones, The Tartar Frigate Restaurant or Star? They offer great food. 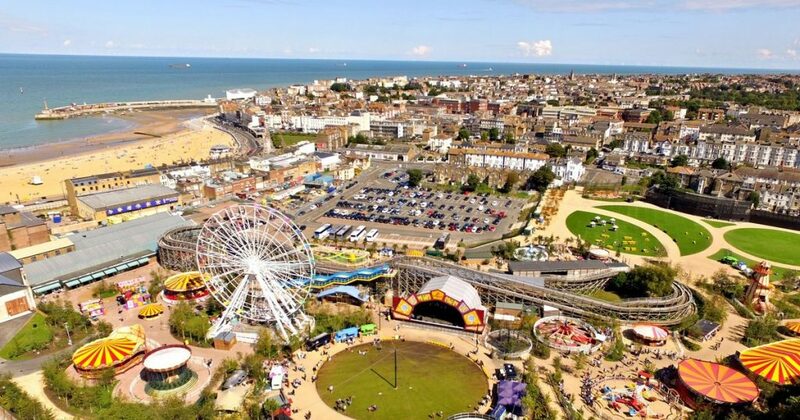 If you wish to burn off those excess calories, you can take the walk to Ramsgate or try water sports. There is so much to do in Broadstairs – It’s interesting, it’s old, and very quaint. Since this is a coastal town most of the restaurants have a lot of fish on the menu which is great if, like us, you really like seafood. That said, there are always meat and veggie alternatives so everyone is happy! These are just a small selection of the restaurants in Broadstairs. We would recommend that you book in advance at the weekend to guarantee a table, and this is essential on any bank holiday or other festival weekend. This is a very popular place to eat in Broadstairs. Wyatt and Jones has been included in the Good Food Guide again for 2017 and has been recommended in The Michelin Guide 2017. The food is fantastic, using lots of Kentish products and the ambience and décor in the restaurant is fabulous. Sit at the bar with a glass of Kentish wine and try local cured meats or a sharing platter. Child friendly, the children’s menu consists of a selection of smaller portions from the adult menu. Take a stroll around Broadstairs and take in its traditional High Street, which is always a pleasant experience. The town is vibrant and diverse with many different shopping outlets from fishmongers to shoe shops and wedding shops to greengrocers – Broadstairs has it all. 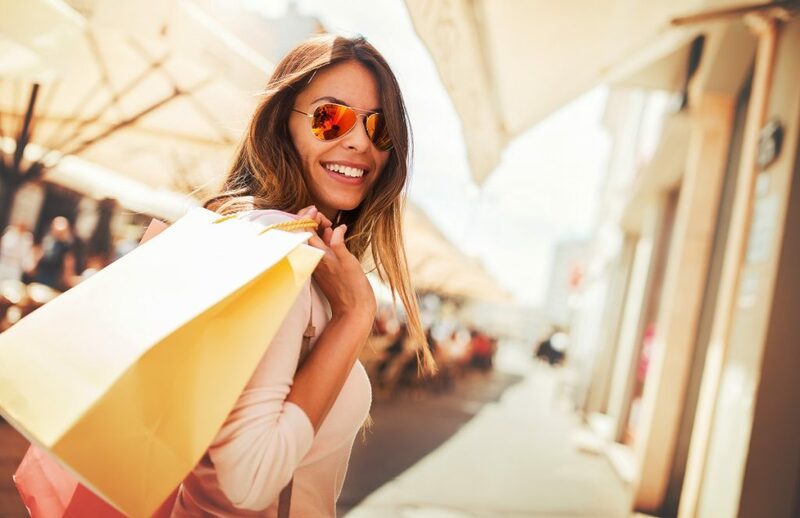 To experience what the Town has to offer regarding shopping you will need to venture onto the High Street, The Broadway, Albion Street, Harbour Street, Charlotte Street and York Street as these are the main shopping areas. Westwood Cross is an out of town Shopping and Leisure Complex. There are free car parking spaces for 1,500 vehicles and 46 stores within the complex with the main stores being Marks and Spencer’s and Debenhams. In the UK we are fortunate to have many Castles full of history and interesting artefacts. Here is our top pick. 5. ?? Mystery Recommendation ?? Curious minds want to know – ask us to find out our mystery recommendation …. we don’t want it all over the internet. Revolution Skate Park welcomes people of all ages and abilities. There are professional staff there to assist and direct anyone who needs tuition. Revolution does not only cater for skateboarders but also BMX riders, scooters as well as rollerbladers so why not pad up and give it a go? Revolution is a state of the art indoor facility built in three large warehouses with the skate park split into a Street Course, Bowl room and a Ramp Room. This inspired facility was first opened in 1998 during which time it has become known as not just one of the finest extreme leisure centres in Kent but the finest in the UK. Alongside the immaculately maintained skate park is another large warehouse, which is home to one of the country’s best indoor climbing facilities. Yet again, this immaculate climbing centre is full of surprises. If interested you can take it a step further and try the Climber Trial Session. When you arrive, you will be given climbing shoes and then be allowed to climb supervised to a height of 9 metres. If this gets the adrenalin pumping and you have Everest in your sights why not give “Bouldering” a go. During the “Bouldering” session you will have to overcome such obstacles as overhangs, cave and natural wall problems and all sent to test your climbing ability. On this wall, you may climb up to 5 metres high. On site there is a cafe, climbing shop, spectators viewing area and toilets plus a lot more. If you fancy a trip down memory lane then Dreamland is the place for you. All the fun of the fair and more! This fairground has been brought into the 21st century with love and attention to detail and is now free to enter and is open all year round. The old rides have been restored while the 1920’s Scenic Railway considered to be the queen of the fairground has been completely refurbished along with the 1930’s Brooklands speedway roundabout. The rides have been painted and the fair has had a lot of investment and there is once again an energy and a buzz about the place. It’s not just the traditional rides any more as a 15000 capacity music venue has been added along with the Octopus garden which is well above your average indoor play area catering for children under 8 years old. There is the Roller Room for your roller skating needs which is open all year round for children’s parties, hen parties and anything in between. Dreamland has also upped its game regarding catering. There is a new food court offering street food plus a new “Tree House Bar” build on stilts. There is also the seafront pub called Cinque Ports with Ziggy’s rooftop Rum Shack. Dreamland is now a great all year round venue for kids and adults alike. Rib Request offer exhilarating adrenalin and fun for all the family. Safety on these excursions is paramount to the company that operates the trips. Therefore a life-jacket is compulsory. Here are a few different trips the Rib Request can take you on. Seals: The Rib will whisk you out to sea where you can get the feel of the wind in your hair as the 200hp engines roar. The boat owners will take you to the locations the seals frequent where you can get close up to the seals and other wildlife. On the return to Ramsgate hold tight because you never know what fun the skipper may have in store for you. The trip lasts approximately one hour. Wind Farm: The Rib will take you seven miles north east of Ramsgate. The destination is Thanet Offshore Wind farm one of the largest wind-farms in the world which is capable of supplying 200,000 homes with clean electricity. The trip will last approximately two hours. 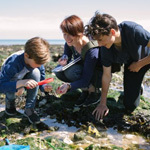 Bays and Beaches: If time is against you or you just want to relax and take in the scenery this is for you with the trip taking you along the Thanet coastline as far as Foreness Point. During the trip you shall see the famous North Foreland Lighthouse, Charles Dickens Bleak House and beaches with several smugglers coves. This fun excursion lasts approximately 1 hour. 9. ?? Mystery Recommendation ? ?